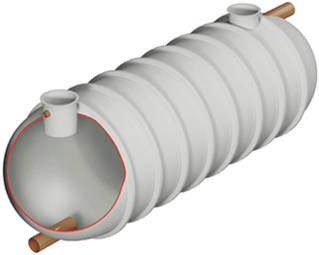 Septic systems are an ideal waste treatment solution for homes or businesses where mains drainage connection isn’t feasible. This waste management system is generally low maintenance but there are some guidelines you should follow to keep your septic tank working smoothly. In this article, we’ve broken down septic tank best practices into a handy list of simple dos and don’ts. Get your septic tank inspected and pumped by a professional every 2-3 years. Systems with mechanical parts – such as electric float switches – should be inspected more frequently – roughly once a year. During the inspection, an engineer will check for leaks, examine the tank’s layers and contents, and carry out any necessary maintenance work. Try to use household cleaners, washing liquids, disinfectants, detergents and the like sensibly – too many chemicals will harm the necessary microbes which break down waste in the tank. Use water efficient fixtures in your home where possible. The less water you use, the less strain there will be on your wastewater system. Water efficient toilets, shower heads and washing machines are great ways to help reduce water use. Spread out clothes washing over a few days rather than doing several loads one after another. This may be convenient but it will be a big burden on your septic system. Make sure you use the proper cycle for the load size you have to further minimise water wastage. Keep trees away from your septic tank and soakaway to ensure the roots don’t cause structural damage to the system. Introduce septic tank additives into your system. These are unnecessary and may even be detrimental to the proper functioning of your water treatment. Connect any gutters or drainage pipes which funnel rainwater to your septic tank. Drive over the area where your septic tank lies, unless it has a special reinforced traffic lid. Ever enter your septic tank; the reduced oxygen and gases produced during the treatment process can be fatal. As you can see, these pointers are pretty easy and cheap to follow and yet they can really help ensure your septic tank is kept in good working condition. Wildon UK is comprised of a team of professional wastewater engineers who have over 20 years of industry experience. Dealing with a wide variety of drainage solutions and sewage treatment systems, our highly trained team are sure to be able to install, maintain or repair your system efficiently and to a high standard. Our experts’ experience extends across domestic, commercial, industrial and agricultural sectors. For further information about our services in Staffordshire or across the UK, get in touch with us today.